Decreased heart rate variability is associated with higher levels of inflammation in middle-aged men. Nevner hvordan HRV relateres til CRP (betennelser) og risiko for hjerte/kar problemer. Many traditional risk factors for coronary artery disease (CAD) are associated with altered autonomic function. Inflammation may provide a link between risk factors, autonomic dysfunction, and CAD. We examined the association between heart rate variability (HRV), a measure of autonomic function, and inflammation, measured by C-reactive protein (CRP) and interleukin-6 (IL-6). We examined 264 middle-aged male twins free of symptomatic CAD. All underwent ambulatory electrocardiogram monitoring and 24-hour ultra low, very low, low, and high-frequency power were calculated using power spectral analysis. C-reactive protein and IL-6 were measured, and risk factors including age, smoking, hypertension, lipids, diabetes, body mass index (BMI), depression, and physical activity were assessed. Physical activity, BMI, high-density lipoprotein cholesterol, smoking, depression, and hypertension were directly associated with CRP and IL-6 and inversely associated with one or more HRV variables. There was a graded inverse relationship between all HRV parameters (except high frequency) and CRP and IL-6. After adjustment for age, BMI, activity, high-density lipoprotein, smoking, hypertension, depression, and diabetes, ultra low frequency and very low frequency remained significant predictors of CRP (P < .01). C-reactive protein is associated with decreased HRV, even after controlling for traditional CAD risk factors. Autonomic dysregulation leading to inflammation may represent one pathway through which traditional risk factors promote development of CAD. 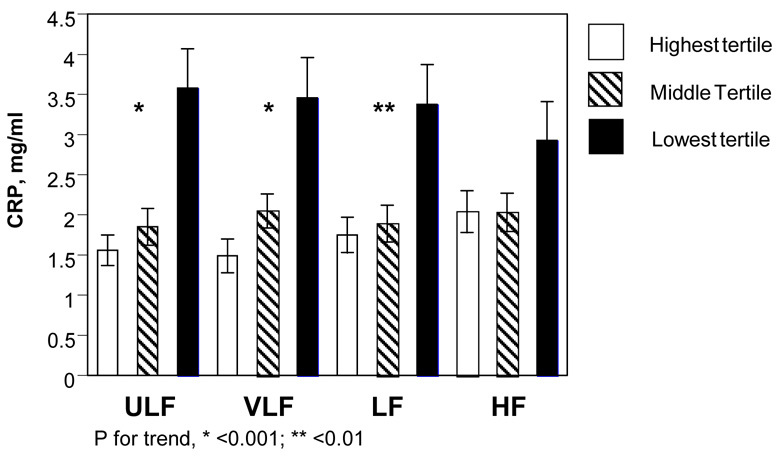 Both CRP and IL-6 were correlated with all HRV variables except HF, most strongly with ULF and VLF. When the group was categorized into tertiles based on HRV variables (Figure 1), CRP increased as HRV decreased. Plasma concentrations of CRP of those in the lowest tertile of ULF and VLF were more than twice that of those in the highest tertile. A similar pattern was seen for IL-6. In middle-aged men free of cardiovascular disease, autonomic dysfunction, as demonstrated by decreased HRV, was associated with higher levels of the inflammatory biomarkers CRP and IL-6. Decreased long-term HRV (ULF and VLF) remained an independent predictor of plasma concentration of CRP after adjustment for CAD risk factors associated with both autonomic dysfunction and inflammation. The inflammatory process is complex, and only two markers were examined in this study. While the association between HRV and CRP remained significant after controlling for other factors, that between HRV and IL-6 did not. IL-6 has a short half-life,31 and varies throughout the day, showing circadian variation,31 whereas CRP levels remain stable over 24 hours.32 This may explain why HRV, measured over 24-hours, showed a stronger association with CRP than IL-6. Sympathetic stimulation inhibits vagal output38, and it is also possible that the relationships seen here between HRV and inflammation were a reflection of sympathetic effects (ie, that low HRV was a marker for increased sympathetic activity) or that the two may have independent effects. Dette innlegget ble publisert i Forskning og artikler og merket med Betennelser, HRV. Bokmerk permalenken.